The BESA machine gun is a British 7.92 mm machine gun, it is a license-built variant of the Czechoslovakian ZB-53 machine gun. The BESA was the British Army's standard tank-mounted machine gun from the start of WW2, until the 1950s, being withdrawn from service in the late 1960s. 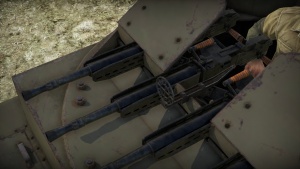 As such in the game it is by far the most ubiquitous machine gun in the British ground forces tree, featuring as the co-axial weapon or commands weapon for most tanks from rank 1 to rank 4. Being only a 7.7 mm machine gun, it is largely ineffective against all but the most weakly armoured, or open cabin, vehicles. The BESA machine gun is fitted as the co-axial (and sometimes commander's) weapon on nearly every British tank from rank 1 to rank 4. The Mk.VIA AA is the only British tank to use the weapon as it's primary armament. Cromwell Mark VIII A27M Cromwell I · Mark VIII A27M Cromwell V · Mark VIII A27M Cromwell V (RP-3) · A.33 Heavy Assault Tank "Excelsior"
The BESA machine gun performs slightly better than other British co-axial machine guns, with the same rate of fire as guns like the L3A1 (7.62 mm) and L8A1 (7.62 mm), but marginally better penetration. When fitted as a secondary machine gun (usually co-axially) the BESA can only be equipped with one ammo belt consisting of two Armour Piercing Incendiary (AP-I) bullets, followed by one Armour Piercing Tracer (AP-T) bullet. Neither bullet has much penetration (10 mm - 13 mm). However, the AP-T bullet performs slightly better than the AP-I bullet. The BESA performs favourably to the L3A1, L8A1, and L8A2 found on later British tanks. It has the same rate of fire as these weapons but better penetration. It has slightly lower rate of fire than the L37A1 and L37A2, but slightly higher penetration. Due to the low penetration this weapon it is largely ineffective against enemy armour (although you may be able to penetrate some vehicles with extremely thing armour). The gun is primarily useful for killing exposed crew members in open-topped vehicles, and SPAA, which can be fairly common at some places in the wide the range battle ratings this gun is found at. Another function for this gun is rangefinding, as well as marking enemy vehicles and obscuring the view of enemy players (shooting at their gun sight). You can use the gun against aircraft however it does minimal damage and is usually co-axially mounted, making hitting aircraft difficult. The BESA machine gun it is a license-built variant of the Czechoslovakian ZB-53 machine gun. The British War Office ordered the weapon in 1938, and production began in 1939. In the UK the gun was produced by the Birmingham Small Arms Company the initialism of which (BSA) gave the gun its name. The ZB-53 had been designed to use the German 7.92 × 57 mm Mauser round, and the British originally intended to modify it in order to use the same .303 (7.7 mm) ammunition as other British rifles and machine guns; however it was later decided that converting the gun would take more time and effort than maintaining the original calibre and procuring the 7.92 mm ammunition. A side effect of this was that the British were able to utilise captured German 7.92 mm ammunition. The from 1939 the BESA machine gun became the standard British machine gun for tanks and other armoured vehicles (hence the widespread presence in the British tank tree), replacing the Vickers Machine Gun. In June 1940 the improved BESA Mk II became available, featuring a selector to allow the operator to choose between a higher rate of fire for close combat or focused targets and a lower rate of fire for long-range combat or area targets. Several further versions of the BESA were produced up until 1966. The early models of the BESA were deemed obsolete in 1951, with later model guns remaining in service until the late 1960s.